Student manipulatives provide multisensory, interactive opportunities that engage students in the fun of building a foundation. At each Level (K, 1, 2, and 3), a complete Fundations® Student Kit includes both durables and consumables. Letter Board: Available in two versions: K-1 or 2-3. The Letter Board is used for arranging Magnetic Letter Tiles or for building words during dictation activities. In the K-1 version, alphabet and syllable frames are printed directly on the board. Magnetic Letter Tiles: These tiles are Level-specific and designed to be used with the Letter Board. Tiles are used for phonemic awareness activities and the development of sound-symbol correspondence and spelling. Depending on the Level, Letter Tiles include consonants, vowels (a, e, i, o, u), digraphs (wh, ch, sh, th, ck), blank vowel and consonant tiles, and other phonemes introduced in the Level. Dry Erase Writing Tablet: The Dry Erase Writing Tablet is two-sided with a large writing grid for letter formation on one side and grids for writing words, sentences, and multisyllabic word work on the other. Gel Word Board with Magic Pen (Level 2 only): The Gel Word Board and magnetic-tipped stylus provide a multisensory opportunity to write and finger-trace high frequency sight words. Student Notebook: Student notebooks are provided by Level. Each Level’s notebook matches the scope and sequence of the respective Teacher’s Manual. Level K: Used by students for letter formation, keyword pictures, and sounds. Students finger-trace the letters, color the keyword pictures, and write letters. Level 1: Used by students as a reference for sounds, spelling rules, vocabulary, and trick words. Sections are alphabetized, and space is provided to enter spelling examples, vocabulary, and trick words. Level 2: Used by students as a reference for sounds, syllable types, spelling rules, vocabulary, and trick words. There is also a dictionary section for spelling options. Level 3: Used by students as a reference for sounds, syllable types, rules and trick words. Includes a vocabulary section and a sound-alike section where students can write in definitions of words learned in the lesson. 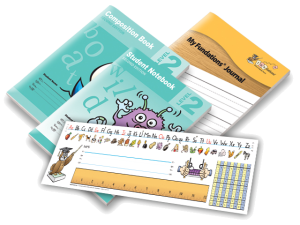 Composition Books: Specifically designed for Levels 1, 2, and 3, each student has a Composition Book for dictation of sounds, words, and sentences. Composition Books provide the writing guides and structure to assist students with letter formation. Also includes Unit Test scoring grid pages for each Unit Test. Desk Strip: A colorful reference tool with Aa-Zz letter/ keyword pictures, numbers, ruler, a counting block, and space for students to print their names. For Level 3, the Cursive Writing Desk Strip is provided. My Fundations Journal: Each two-page spread includes a box for drawing and the Wilson grid. For more information please see our catalog. To order the specific materials for the Level you are implementing please visit our online store.